"In addition to the artistic works available from Oil Paintings by Paul Bremer, my wife and I have written books in which we reflect on our life experiences. These books are available on Amazon™, and they come in formats that are compatible with iPads™, Kindles™, and Nooks™." My Year in Iraq: The Struggle to Build a Future of Hope tells my story as the presidential envoy to Iraq. It examines the challenges that we faced while helping the Iraqi people reclaim their country after Saddam's fall. In 2010, I was blessed with the opportunity to ride across the country with the brave men and women who defend it. 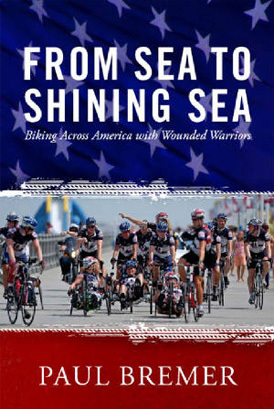 From Sea to Shining Sea: Biking Across America with Wounded Warriors is the inspiring story of 16 injured soldiers who rode more than 4,000 miles. This book shares tales of the people they met along the way and the adventure of a lifetime. My wife is also a skilled author who has written books on marriage and religion. Running to Paradise is the true story of a young man's struggle to become a priest. Frances uses his marathon training as a metaphor for his ordination. She was inspired to write this tale when we converted to Catholicism late in life. Coping with his Success: A Survival Guide for Wives takes a close look at how a woman can build a lasting, effective marriage with a successful man.